This mattress was delivered on-time and as advertised. We've been sleeping on it for a few nights now and it is like sleeping on a firm cloud. No more bouncing around by flip-flopping spouse and no more achy backs in the morning. Highly recommend! Enjoy premium support that contours to the curves of your body from the multiple layers in this gel memory foam mattress. 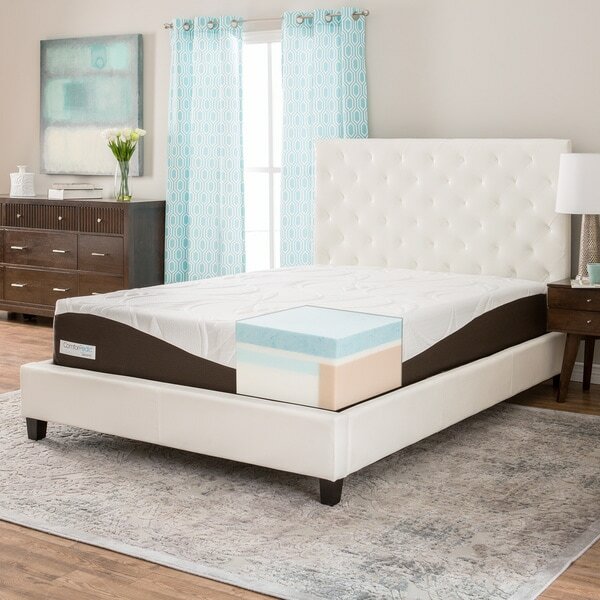 Three inches of AirCool memory foam on top and an AirCool edge dissipate heat for a comfortable temperature regardless of the weather, and memory foam also helps eliminate pressure points and reduce motion transfer for better sleep with a partner. This is our 3rd comforpedic mattress. It's for our child's room. I can't say enough great things about the quality and comfort from comforpedic. We paid a lot more for the other 2 comforpedic mattresses we own. (Master and guest). I was shocked at how low the price is on overstock. We have 2, 10 inch and this will be our first 12 inch. Our son wanted a bit softer bed, without being to plush. This seems to fit the bill. The 10 inch is a bit more firm, if you like semi firm/firm go with the 10 inch. This mattress seems to be a hybrid of firm and plush. I ordered it on a Monday and received it on Friday of the same week. It comes shrink wrapped in a bag. It's very easy to maneuver up a flight of stairs and open. Very minimal smell, once opened. Make sure to open within 72 hours of receiving. This mattress will go on a platform bed, so no feedback about a box spring. This is a GREAT quality mattress, don't hesitate to purchase. Our other 2 mattresses are 3 to 5 yrs old and still feel and look great. I was worried about buying a mattress online, not being able to test them out first. I also sleep hot, so I knew if I went with a memory foam it would have to have gel. 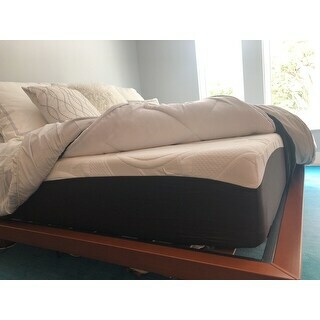 Well, after reading tons of reviews and deciding the lower priced budget models weren't the quality I was looking for, I decided to go with this Comforpedic based on the foam layer composition. I'm glad I did. It came in a decently small bag, small enough that my roommate commented that they probably sent me the wrong size. Well, sure enough when I unwrapped it instantly unfolded to a regular full sized queen and started inflating. No more than 15 minutes had gone by before it was already about 10 inches thick. I noticed no off gassing, at least not anything worth mentioning. The very first night I slept on it I was in heaven. It's slightly firmer than I was imagining, since I'd never slept on a memory foam mattress. However, it's definitely not nearly as firm as my old spring mattress it replaced. They got it right when they said it's a 'medium' firmness, I agree. The foam does seem to return to it's original shape much quicker than I thought memory foam would, it's near instant. No waking up hot, no getting stuck in a trench, easy to move, and it's seriously the most comfortable mattress I've ever slept on. Not to mention the price is great. If you're on the fence don't hesitate, just buy it, you'll be glad you did. I love my new matterss! This is my first written review, although I always read them to help me decide on major products. I have never owned a memory foam mattress before, but I have slept on them as a guest at my son's house. I was always comfortable and well rested but I would get hot and have the sensation of rolling out of bed. I researched and read reviews and found that this particular mattress address all the issues I had with memory foam. My new mattress is firm but conforms and supports. The reinforced sides are soft and give when sitting on the edge of the bed but provide the stability when laying in bed, rolling over etc. The gel foam feels cool at first, will heat up with body temperature but the heat quickly dissipates do to the ventilated sides. I followed the unpacking instructions carefully because once opened there are no returns on the product. My husband and myself were prepared to make other sleeping arrangements to allow for the mattress to expand and air out as other reviews had suggested. We found no odor released and it expanded almost immediately. (so be sure to have it in place before opening) That night we slept comfortably, key word is SLEPT. I haven't slept over two hours at once for a long time. What a relief. Five stars and four thumbs up from this couple. This is my first Memory Foam mattress, and I am very pleased. It was delivered to my new home for free, it was easy to drag into the bedroom, with no help needed, because of the packaging. I can't believe how full the mattress got after un-packaging, but it is more plush and comfortable than my former traditional mattresses. Worried it woukd be either too soft or hard, but it is perfect. We got the 12 inch and love it!! The mattress is The most comfortable mattress I've owned. Really love it. We sleep deeper and wake up less in the night. 5stars! It’s a very difficult decision to purchase a mattress online. Our 6 year old foam mattress was just okay. We started to notice a sagging area where you slept so the search for a new mattress began. 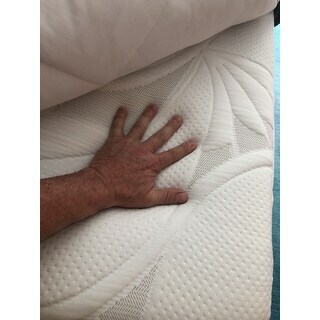 I found this mattress on Overstock by sorting listings by reviews and then we found this king size mattress. I was overly impressed by all the positive comments. I ordered it on a Monday and it arrived Friday, super fast shipping! It comes rolled up in a vacuum sealed bag. It took 2 of us to get it upstairs. Once positioned on our platform bed we began to remove the plastic (lots of plastic) once opened the mattress immediately began to expand. Within 4 hours it was 80% of its reachable size. We slept on it that night and woke up feeling extremely refreshed. My wife and I both agreed that it was the best nights sleep we’ve ever had. I’m writing this review 1 week later and I can’t tell you how happy we are! It’s the best mattress we’ve ever owned and by far the best purchase on overstock. This was a phenomenal buy, it’s made in the US. It ships quickly. There are no orders when you unwrap it. We are 1000% satisfied with our new bed! I am so happy with this mattress, I have a very bad back multiple surgeries. I slept great!! I woke up without any pain. The set up was very easy, just had to remove the plastic and un-roll. It has been over a year now and am still very happy with this mattress. I have to make sure that the sheets I buy have deep pockets. No sigh of any wear!! Love Love Love this mattress! The bed is great quality - a little firmer than expected for "medium firmness." I think it is more me coming from a very soft topped mattress. Very Comfortable my husband and I love it conforms to your body shape. This is the first time I’ve purchased a mattress of this kind and I must say I was pleasantly surprised. This mattress has the firmness I was looking for and gives me a perfectly comfortable nights sleep. I highly recommended this mattress to everyone. We bought the exact mattress for ourselves 2 years ago and love it so we bought one for our son. He has only slept in it a few nights but loves it as well. We no longer suffer from back pain and no lumps or bumps from use. I totally recommend this mattress! Super comfy... super fast shipping. We bought this to replace one similar band it did not disappoint. Thanks, Overstock! Very nice we like the mattress. Great mattress, super comfortable. My cousin introduced me to this mattress and I helped him unload a couple of these mattresses. Usually the mattress is in a black bag, and even shows that in the picture. Mine was in a mutilated box with some marks on the actual sealed bag. I got lucky that the bag wasn’t punctured by the way the boxed this one up. Only reason I have it at three stars is the careless package job and not being packaged like the 4 mattresses I helped my cousin with. The mattress is great, but the packaging was not. Hopefully it doesn't get bad with time , but it’s great for back support specially if you are expecting and your back is killing you I pain when away. I bought the exact same mattress from a local mattress store for $1700 a few years ago. Although I love the mattress, I hated dropping that kind of money on my budget. When I came across this mattress on Overstock for this price I couldn’t resist buying another for my extra bedroom. This is MUCH softer than any firm mattress I have ever felt, not supportive for sitting up in bed, but very conducive to sleep. Really comfortable laying down. Very comfy. Amazing how it opens up and unfolds. So easy. "What are the shipping dimensions and weight of the queen size mattress?" The shipping box is H: 18 W: 23 L: 40. 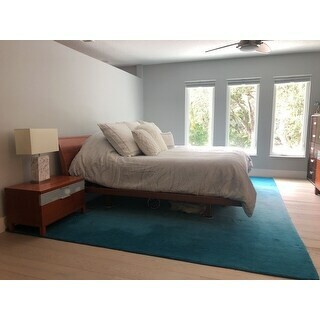 "can this bed be used on an adjustable base? if not, can you suggest a mattress in the box that can? thank you." Yes, this mattress is adjustable-friendly. "What is the density level of this mattress?" Comfort: Medium First layer: 3-in AirCool Memory Foam with Gel Second layer: 1-in Comfort Transition Layer Third layer: 2-in Comfort Layer Fourth layer: 2-in Support Layer Base foam: 4-in Base Layer Thickness 12 inches. "How would you rate the firmness of this mattress?" "Does this mattress really sleep cool? " "My husband has asthma. Approximately 5-6 years ago we tried a memory foam mattress, bought at a discount chain. It was a no-name brand. We aired it out in the garage for over a week during Texas summer heat. But, my husband still suffered severe asthma attacks. My question: has the technology of these kind of mattresses improved so that it is safe for asthmatics? If he has a reaction, can it be returned?" We cannot make any medical claims or make medical recommendations, therefore we do recommend consulting with your doctor before purchasing. Unfortunately, the mattress cannot be returned once it has been opened. "Does this mattress have firm support?" Is this mattress made with firm support?